Homeopathy for depression? No, certainly not! Homeopathy for depression? A previous review concluded that the evidence for the effectiveness of homeopathy in depression is limited due to lack of clinical trials of high quality. But that was 13 years ago. Perhaps the evidence has changed? A new review aimed to assess the efficacy, effectiveness and safety of homeopathy in depression. Eighteen studies assessing homeopathy in depression were included. Two double-blind placebo-controlled trials of homeopathic medicinal products (HMPs) for depression were assessed. The first trial (N = 91) with high risk of bias found HMPs were non-inferior to fluoxetine at 4 and 8 weeks. The second trial (N = 133), with low risk of bias, found HMPs was comparable to fluoxetine and superior to placebo at 6 weeks. The remaining research had unclear/high risk of bias. A non-placebo-controlled RCT found standardised treatment by homeopaths comparable to fluvoxamine; a cohort study of patients receiving treatment provided by GPs practising homeopathy reported significantly lower consumption of psychotropic drugs and improved depression; and patient-reported outcomes showed at least moderate improvement in 10 of 12 uncontrolled studies. Fourteen trials provided safety data. All adverse events were mild or moderate, and transient. No evidence suggested treatment was unsafe. The authors concluded that limited evidence from two placebo-controlled double-blinded trials suggests HMPs might be comparable to antidepressants and superior to placebo in depression, and patients treated by homeopaths report improvement in depression. Overall, the evidence gives a potentially promising risk benefit ratio. There is a need for additional high quality studies. The two ‘double-blind’ trials are next to meaningless. As equivalence studies they were far too small to produce meaningful results. Any decent review should discuss this fact in full detail. Moreover, these studies cannot have been double-blind, because the typical adverse-effects of anti-depressants would have ‘de-blinded’ the trial participants. Therefore, these results are almost certainly false-positive. The other studies are even less rigorous and therefore do also not allow positive conclusions. This review was authored by known proponents of homeopathy. It is, in my view, an exercise in promotion rather than a piece of research. I very much doubt that a decent journal with a responsible peer-review system would have ever published such a biased paper – it had to appear in the infamous EUROPEAN JOURNAL OF INTEGRATIVE MEDICINE. Who cares? No harm done! Again, I beg to differ. The conclusion that homeopathy has a ‘promising risk/benefit profile’ is frightfully dangerous and irresponsible. If seriously depressed patients follow it, many lives might be lost. Yet again, we see that poor research has the potential to kill vulnerable individuals. Aromatherapy usually involves the application of diluted essential (volatile) oils via a gentle massage of the body surface. The chemist Rene-Maurice Gattefosse (1881-1950) coined the term ‘aromatherapy’ after experiencing that lavender oil helped to cure a severe burn of his hand. In 1937, he published a book on the subject: Aromathérapie: Les Huiles Essentielles, Hormones Végétales. Later, the French surgeon Jean Valnet used essential oils to help heal soldiers’ wounds in World War II. Aromatherapy is currently one of the most popular of all alternative therapies. The reason for its popularity seems simple: it is an agreeable, luxurious form of pampering. Whether it truly merits to be called a therapy is debatable. The authors of this systematic review stated that they wanted to critically assess the effect of aromatherapy on the psychological symptoms as noted in the postmenopausal and elderly women. They conducted electronic literature searches and fount 4 trials that met their inclusion criteria. The findings demonstrated that aromatherapy massage significantly improves psychological symptoms in menopausal, elderly women as compared to controls. In one trial, aromatherapy massage was no more effective than the untreated group regarding their experience of symptoms such as nervousness. The authors concluded that aromatherapy may be beneficial in attenuating the psychological symptoms that these women may experience, such as anxiety and depression, but it is not considered as an effective treatment to manage nervousness symptom among menopausal women. This finding should be observed in light of study limitations. Aromatherapy is the therapeutic use of essential oil from herbs, flowers, and other plants. The aim of this overview was to provide an overview of systematic reviews evaluating the effectiveness of aromatherapy. We searched 12 electronic databases and our departmental files without restrictions of time or language. The methodological quality of all systematic reviews was evaluated independently by two authors. Of 201 potentially relevant publications, 10 met our inclusion criteria. Most of the systematic reviews were of poor methodological quality. The clinical subject areas were hypertension, depression, anxiety, pain relief, and dementia. For none of the conditions was the evidence convincing. Several SRs of aromatherapy have recently been published. Due to a number of caveats, the evidence is not sufficiently convincing that aromatherapy is an effective therapy for any condition. Aromatherapy is becoming increasingly popular; however there are few clear indications for its use. To systematically review the literature on aromatherapy in order to discover whether any clinical indication may be recommended for its use, computerised literature searches were performed to retrieve all randomised controlled trials of aromatherapy from the following databases: MEDLINE, EMBASE, British Nursing Index, CISCOM, and AMED. The methodological quality of the trials was assessed using the Jadad score. All trials were evaluated independently by both authors and data were extracted in a pre-defined, standardised fashion. Twelve trials were located: six of them had no independent replication; six related to the relaxing effects of aromatherapy combined with massage. These studies suggest that aromatherapy massage has a mild, transient anxiolytic effect. Based on a critical assessment of the six studies relating to relaxation, the effects of aromatherapy are probably not strong enough for it to be considered for the treatment of anxiety. The hypothesis that it is effective for any other indication is not supported by the findings of rigorous clinical trials. Omitting previous research may be odd, but it is not a fatal flaw. What makes this review truly dismal is the fact that the authors fail to discuss the poor quality of the primary studies. They are of such deplorable rigor that one can really not draw any conclusion at all from them. I therefore find the conclusions of this new paper unacceptable and think that our statement (even though a few years old) is much more accurate: the evidence is not sufficiently convincing that aromatherapy is an effective therapy for any condition. Homeopathy is not helpful for depression – on the contrary, it depresses me! This systematic review included 18 studies assessing homeopathy in depression. Two double-blind placebo-controlled trials of homeopathic medicinal products (HMPs) for depression were assessed. The first trial (N = 91) with high risk of bias found HMPs were non-inferior to fluoxetine at 4 (p = 0.654) and 8 weeks (p = 0.965); whereas the second trial (N = 133), with low risk of bias, found HMPs was comparable to fluoxetine (p = 0.082) and superior to placebo (p < 0.005) at 6 weeks. It is worth having a look at these two studies, I think. Homeopathy is a complementary and integrative medicine used in depression, The aim of this study is to investigate the non-inferiority and tolerability of individualized homeopathic medicines [Quinquagintamillesmial (Q-potencies)] in acute depression, using fluoxetine as active control. Ninety-one outpatients with moderate to severe depression were assigned to receive an individualized homeopathic medicine or fluoxetine 20 mg day−1 (up to 40 mg day−1) in a prospective, randomized, double-blind double-dummy 8-week, single-center trial. Primary efficacy measure was the analysis of the mean change in the Montgomery & Åsberg Depression Rating Scale (MADRS) depression scores, using a non-inferiority test with margin of 1.45. Secondary efficacy outcomes were response and remission rates. Tolerability was assessed with the side effect rating scale of the Scandinavian Society of Psychopharmacology. Mean MADRS scores differences were not significant at the 4th (P = .654) and 8th weeks (P = .965) of treatment. Non-inferiority of homeopathy was indicated because the upper limit of the confidence interval (CI) for mean difference in MADRS change was less than the non-inferiority margin: mean differences (homeopathy-fluoxetine) were −3.04 (95% CI −6.95, 0.86) and −2.4 (95% CI −6.05, 0.77) at 4th and 8th week, respectively. There were no significant differences between the percentages of response or remission rates in both groups. Tolerability: there were no significant differences between the side effects rates, although a higher percentage of patients treated with fluoxetine reported troublesome side effects and there was a trend toward greater treatment interruption for adverse effects in the fluoxetine group. This study illustrates the feasibility of randomized controlled double-blind trials of homeopathy in depression and indicates the non-inferiority of individualized homeopathic Q-potencies as compared to fluoxetine in acute treatment of outpatients with moderate to severe depression. Contrary to what the reviewers claim, the trial had no placebo group. It was a double-dummy equivalence study comparing individualised homeopathy with the antidepressant fluoxetine. Fluoxetine might have been under-dosed (see below). Equivalence studies require large sample sizes, and with just 91 patients (only 55 of whom finished the study), this trial was underpowered which means the finding of equivalence is false positive. The authors noted that a higher percentage of troublesome adverse effects reported by patients receiving fluoxetine. This means that the trial was not double-blind; patients were able to tell by their side-effects which group they were in. The authors also state that more patients randomized to homeopathy than to fluoxetine were excluded due to worsening of their depressive symptoms. I think this confirms that homeopathy was ineffective. Background: Perimenopausal period refers to the interval when women’s menstrual cycles become irregular and is characterized by an increased risk of depression. Use of homeopathy to treat depression is widespread but there is a lack of clinical trials about its efficacy in depression in peri- and postmenopausal women. The aim of this study was to assess efficacy and safety of individualized homeopathic treatment versus placebo and fluoxetine versus placebo in peri- and postmenopausal women with moderate to severe depression. Methods/Design: A randomized, placebo-controlled, double-blind, double-dummy, superiority, three-arm trial with a 6 week follow-up study was conducted. The study was performed in a public research hospital in Mexico City in the outpatient service of homeopathy. One hundred thirty-three peri- and postmenopausal women diagnosed with major depression according to DSM-IV (moderate to severe intensity) were included. The outcomes were: change in the mean total score among groups on the 17-item Hamilton Rating Scale for Depression, Beck Depression Inventory and Greene Scale, after 6 weeks of treatment, response and remission rates, and safety. Efficacy data were analyzed in the intention-to-treat population (ANOVA with Bonferroni post-hoc test). Results: After a 6-week treatment, homeopathic group was more effective than placebo by 5 points in Hamilton Scale. Response rate was 54.5% and remission rate, 15.9%. There was a significant difference among groups in response rate definition only, but not in remission rate. Fluoxetine-placebo difference was 3.2 points. No differences were observed among groups in the Beck Depression Inventory. Homeopathic group was superior to placebo in Greene Climacteric Scale (8.6 points). Fluoxetine was not different from placebo in Greene Climacteric Scale. Conclusion: Homeopathy and fluoxetine are effective and safe antidepressants for climacteric women. 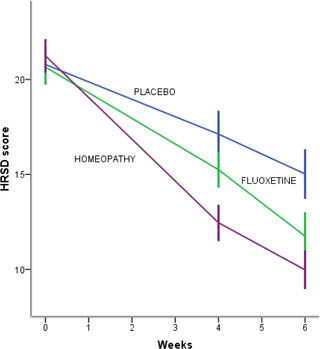 Homeopathy and fluoxetine were significantly different from placebo in response definition only. Homeopathy, but not fluoxetine, improves menopausal symptoms scored by Greene Climacteric Scale. The aim of a small study like this cannot be to assess or draw conclusions about the safety of the interventions used; for this purpose, we need sample sizes that are at least one dimension bigger. The blinding of patients might have been jeopardized by patients experiencing the specific side-effects of fluoxetine. The authors reported adverse effects in all three groups. However, the characteristic and most common side-effects of fluoxetine (such as hives, itching, skin rash, restlessness, inability to sit still) were not included. Initial dose: 90 mg orally once a week, commenced 7 days after the last daily dose of immediate-release fluoxetine 20 mg formulations. Considering all this, I feel that the conclusions of the above review are far too optimistic and not justified. In fact, I find them misleading, dangerous, unethical and depressing. I have often cautioned my readers about the ‘evidence’ supporting acupuncture (and other alternative therapies). Rightly so, I think. Here is yet another warning. This systematic review assessed the clinical effectiveness of acupuncture in the treatment of postpartum depression (PPD). Nine trials involving 653 women were selected. A meta-analysis demonstrated that the acupuncture group had a significantly greater overall effective rate compared with the control group. Moreover, acupuncture significantly increased oestradiol levels compared with the control group. Regarding the HAMD and EPDS scores, no difference was found between the two groups. The Chinese authors concluded that acupuncture appears to be effective for postpartum depression with respect to certain outcomes. However, the evidence thus far is inconclusive. Further high-quality RCTs following standardised guidelines with a low risk of bias are needed to confirm the effectiveness of acupuncture for postpartum depression. Let’s start with the conclusion: if the authors feel that the evidence is ‘inconclusive’, why do they state that ‘acupuncture appears to be effective for postpartum depression‘. To me this does simply not make sense! Such oddities are abundant in the review. The abstract does not mention the fact that all trials were from China (published in Chinese which means that people who cannot read Chinese are unable to check any of the reported findings), and their majority was of very poor quality – two good reasons to discard the lot without further ado and conclude that there is no reliable evidence at all. The authors also tell us very little about the treatments used in the control groups. In the paper, they state that “the control group needed to have received a placebo or any type of herb, drug and psychological intervention”. But was acupuncture better than all or any of these treatments? I could not find sufficient data in the paper to answer this question. Moreover, only three trials seem to have bothered to mention adverse effects. Thus the majority of the studies were in breach of research ethics. No mention is made of this in the discussion. In the paper, the authors re-state that “this meta-analysis showed that the acupuncture group had a significantly greater overall effective rate compared with the control group. Moreover, acupuncture significantly increased oestradiol levels compared with the control group.” This is, I think, highly misleading (see above). Finally, let’s have a quick look at the journal ‘Acupuncture in Medicine’ (AiM). Even though it is published by the BMJ group (the reason for this phenomenon can be found here: “AiM is owned by the British Medical Acupuncture Society and published by BMJ”; this means that all BMAS-members automatically receive the journal which thus is a resounding commercial success), it is little more than a cult-newsletter. The editorial board is full of acupuncture enthusiasts, and the journal hardly ever publishes anything that is remotely critical of the wonderous myths of acupuncture. My conclusion considering all this is as follows: we ought to be very careful before accepting any ‘evidence’ that is currently being published about the benefits of acupuncture, even if it superficially looks ok. More often than not, it turns out to be profoundly misleading, utterly useless and potentially harmful pseudo-evidence. Effectiveness of acupuncture in postpartum depression: a systematic review and meta-analysis. Li S, Zhong W, Peng W, Jiang G.
Homeopathy for psychiatric patients? Yes, apparently, it is ‘advisable’, even in severe cases! The two German authors start their article (it is in German but has an English abstract to which I refer here) by claiming that “homeopathy is steadily gaining in sympathy in the population.” This is a very odd statement, considering that the sales figures in Germany and elsewhere have, in fact, been declining. Any homeopathy-paper with such an opening is naturally of interest to me. The effectiveness of homeopathy has now been tested in about 500 clinical trials, and the totality of the reliable evidence from these studies fails to show that highly diluted homeopathic remedies are more than placebos. The mode of action of homeopathy isn’t “not scientifically elucidated“, but the relevant science tells us that there cannot be a mode of action that is in line with the laws of nature as we understand them today. To systematically review placebo-controlled randomized trials of homeopathy for psychiatric conditions. Eligible studies were identified using the following databases from database inception to April 2010: PubMed, CINAHL, PsycINFO, Hom-Inform, Cochrane CENTRAL, National Center for Complementary and Alternative Medicine grantee publications database, and ClinicalTrials.gov. Gray literature was also searched using Google, Google Scholar, the European Committee for Homeopathy, inquiries with homeopathic experts and manufacturers, and the bibliographic lists of included published studies and reviews. Search terms were as follows: (homeopath* or homoeopath*) and (placebo or sham) and (anxiety or panic or phobia or post-traumatic stress or PTSD or obsessive-compulsive disorder or fear or depress* or dysthym* or attention deficit hyperactivity or premenstrual syndrome or premenstrual disorder or premenstrual dysphoric disorder or traumatic brain injury or fibromyalgia or chronic fatigue syndrome or myalgic encephalitis or insomnia or sleep disturbance). Searches included only English-language literature that reported randomized controlled trials in humans. Trials were included if they met 7 criteria and were assessed for possible bias using the Scottish Intercollegiate Guidelines Network (SIGN) 50 guidelines. Overall assessments were made using the Grading of Recommendations Assessment, Development and Evaluation procedure. Identified studies were grouped into anxiety or stress, sleep or circadian rhythm complaints, premenstrual problems, attention-deficit/hyperactivity disorder, mild traumatic brain injury, and functional somatic syndromes. Twenty-five eligible studies were identified from an initial pool of 1,431. Study quality according to SIGN 50 criteria varied, with 6 assessed as good, 9 as fair, and 10 as poor. Outcome was unrelated to SIGN quality. Effect size could be calculated in 16 studies, and number needed to treat, in 10 studies. Efficacy was found for the functional somatic syndromes group (fibromyalgia and chronic fatigue syndrome), but not for anxiety or stress. For other disorders, homeopathy produced mixed effects. No placebo-controlled studies of depression were identified. Meaningful safety data were lacking in the reports, but the superficial findings suggested good tolerability of homeopathy. A funnel plot in 13 studies did not support publication bias (χ(2)(1) = 1.923, P = .166). The database on studies of homeopathy and placebo in psychiatry is very limited, but results do not preclude the possibility of some benefit. To systematically review the research evidence on the effectiveness of homeopathy for the treatment of depression and depressive disorders. A comprehensive search of major biomedical databases including MEDLINE, EMBASE, CINAHL, PsycINFO and the Cochrane Library was conducted. Specialist complementary and alternative medicine (CAM) databases including AMED, CISCOM and Hom-Inform were also searched. Additionally, efforts were made to identify unpublished and ongoing research using relevant sources and experts in the field. Relevant research was categorised by study type and appraised according to study design. Clinical commentaries were obtained for studies reporting clinical outcomes. Only two randomised controlled trials (RCTs) were identified. One of these, a feasibility study, demonstrated problems with recruitment of patients in primary care. Several uncontrolled and observational studies have reported positive results including high levels of patient satisfaction but because of the lack of a control group, it is difficult to assess the extent to which any response is due to specific effects of homeopathy. Single-case reports/studies were the most frequently encountered clinical study type. We also found surveys, but no relevant qualitative research studies were located. : Adverse effects reported appear limited to ‘remedy reactions’ (‘aggravations’) including temporary worsening of symptoms, symptom shifts and reappearance of old symptoms. These remedy reactions were generally transient but in one study, aggravation of symptoms caused withdrawal of the treatment in one patient. A comprehensive search for published and unpublished studies has demonstrated that the evidence for the effectiveness of homeopathy in depression is limited due to lack of clinical trials of high quality. Further research is required, and should include well-designed controlled studies with sufficient numbers of participants. Qualitative studies aimed at overcoming recruitment and other problems should precede further RCTs. Methodological options include the incorporation of preference arms or uncontrolled observational studies. The highly individualised nature of much homeopathic treatment and the specificity of response may require innovative methods of analysis of individual treatment response. Back to the new article I started discussing above. Its authors make a vague attempt at being reasonable: “It is clear that homoeopathic remedies can only be used as an add-on and not alone.” I find this statement slightly puzzling. If (as the authors assume) homeopathy is effective for mental disorders, why not on its own? Can a therapy that must not be used as a sole treatment be called effective? The authors continue with another caveat: “These remedies belong in the hands of physicians experienced in homeopathic and psychiatric psychopharmacology.” That’s actually quite funny! As the average homeopath has no experience in psychiatric psychopharmacology, they must not use homeopathy for mental conditions. I would agree with the conclusion but not with the reason given for it. And now to the ‘grand finale’, the conclusion: “It would be advisable to at least try out homeopathy for the well-being of the patient not only in the case of very mild disorders but also in severe chronic cases, since due to the generally good tolerability, no avoidable disadvantage should result.” That sort of conclusion makes me almost speechless. The evidence fails to show that it works, yet it is ADVISABLE to use it in severe chronic cases! Such articles suggest to me that homeopathy is a cult where logic and reason are irrelevant and need to be supressed. They also indicate that something is amiss with medical publishing. How can it be that, in 2018, ‘Der Nervenarzt’ (or any other medical journal for that matter) can be so bar of critical thinking to publish such dangerously misleading nonsense? ‘Der Nervenarzt‘, by the way, claims to be an internationally recognized journal addressing neurologists and psychiatrists working in clinical or practical environments. Essential findings and current information from neurology, psychiatry as well as neuropathology, neurosurgery up to psychotherapy are presented. “Shiatsu significantly reduced depression in a sample of mild-to-moderate AD patients.” ??? Not really! Shiatsu is an alternative therapy that is popular, but has so far attracted almost no research. Therefore, I was excited when I saw a new paper on the subject. Sadly, my excitement waned quickly when I stared reading the abstract. This single-blind randomized controlled study was aimed to evaluate shiatsu on mood, cognition, and functional independence in patients undergoing physical activity. Alzheimer disease (AD) patients with depression were randomly assigned to the “active group” (Shiatsu + physical activity) or the “control group” (physical activity alone). Shiatsu was performed by the same therapist once a week for ten months. Global cognitive functioning (Mini Mental State Examination – MMSE), depressive symptoms (Geriatric Depression Scale – GDS), and functional status (Activity of Daily Living – ADL, Instrumental ADL – IADL) were assessed before and after the intervention. The researchers found a within-group improvement of MMSE, ADL, and GDS in the Shiatsu group. However, the analysis of differences before and after the interventions showed a statistically significant decrease of GDS score only in the Shiatsu group. The authors concluded that the combination of Shiatsu and physical activity improved depression in AD patients compared to physical activity alone. The pathomechanism might involve neuroendocrine-mediated effects of Shiatsu on neural circuits implicated in mood and affect regulation. We first evaluated the effect of Shiatsu in depressed patients with Alzheimer’s disease (AD). Shiatsu significantly reduced depression in a sample of mild-to-moderate AD patients. Neuroendocrine-mediated effect of Shiatsu may modulate mood and affect neural circuits. 1 The study is called a ‘pilot’. As such it should not draw conclusions about the effectiveness of Shiatsu. 2 The design of the study was such that there was no accounting for the placebo effect (the often-discussed ‘A+B vs B’ design); therefore, it is impossible to attribute the observed outcome to Shiatsu. The ‘highlight’ – Shiatsu significantly reduced depression in a sample of mild-to-moderate AD patients – therefore turns out to be a low-light. 3 As this was a study with a control group, within-group changes are irrelevant and do not even deserve a mention. 4 The last point about the mode of action is pure speculation, and not borne out of the data presented. 5 Accumulating so much nonsense in one research paper is, in my view, unethical. Research into alternative medicine does not have a good reputation – studies like this one are not inclined to improve it. This randomized controlled trial was aimed to investigate the effect of aromatherapy massage on anxiety, depression, and physiologic parameters in older patients with acute coronary syndrome. It was conducted on 90 older women with acute coronary syndrome. The participants were randomly assigned into the intervention and control groups. The intervention group received reflexology with lavender essential oil plus routine care and the control group only received routine care. Physiologic parameters, the levels of anxiety and depression in the hospital were evaluated using a checklist and the Hospital’s Anxiety and Depression Scale, respectively, before and immediately after the intervention. Significant differences in the levels of anxiety and depression were reported between the groups after the intervention. The analysis of physiological parameters revealed a statistically significant reduction in systolic blood pressure, diastolic blood pressure, mean arterial pressure, and heart rate. However, no significant difference was observed in the respiratory rate. The authors concluded that aromatherapy massage can be considered by clinical nurses an efficient therapy for alleviating psychological and physiological responses among older women suffering from acute coronary syndrome. This trial does not show remotely what the authors think. It demonstrates that A+B is always more than B. We have discussed this phenomenon so often that I hesitate to mention it again. Any study with the ‘A+B versus B’ design can only produce a positive result. The danger that this result is false-positive is so high that it is best to forget about such investigations altogether. Ethics committees should not accept such protocols. Researchers should stop running such studies. Reviewers should not pass them for publication. Editors should not publish such trials. THEY MISLEAD ALL OF US AND GIVE CLINICAL RESEARCH A BAD NAME. Homeopathy is effective for anxiety and depression disorders!!! Or isn’t it? or are certified homeopathic GPs (GP-Ho). The investigation was an epidemiological cohort study of general practice in France, which included GPs and their patients consulting for ADDs (scoring 9 or more in the Hospital Anxiety and Depression Scale, HADS). Information on all medication utilization was obtained by a standardised telephone interview at inclusion, 1, 3 and 12 months. Of 1562 eligible patients consulting for ADDs, 710 (45.5 %) agreed to participate. Adjusted multivariate analyses showed that GP-Ho and GP-Mx patients were less likely to use psychotropic drugs over 12 months, compared to GP-CM patients. The rate of clinical improvement (HADS <9) was marginally superior for the GP-Ho group as compared to the GP-CM group, but not for the GP-Mx group. The authors concluded that patients with ADD, who chose to consult GPs prescribing homeopathy reported less use of psychotropic drugs, and were marginally more likely to experience clinical improvement, than patients managed with conventional care. Results may reflect differences in physicians’ management and patients’ preferences as well as statistical regression to the mean. Aren’t we glad they added the last sentence to their conclusion!!! Without it, one might have thought that the observed differences were due to the homeopathic remedies. In fact, the finding amounts to a self-fulfilling prophecy: Homeopaths tend to be against prescribing conventional drugs. This means that patients consulting homeopaths are bound to use less drugs than patients who consult conventional doctors. In that sense, the study was like monitoring whether consumers who go to the butchers buy more meat than those shopping in a shop for vegetarians. The only result that requires a more serious consideration is that homeopathically treated patients experienced more clinical improvement than those treated conventionally. But even this difference is not hard to explain: firstly, the difference was merely marginal; secondly, patients with ADD are bound to respond particularly well to the empathetic and long therapeutic encounter most homeopaths offer. In other words, the difference had nothing to do with the alleged effectiveness of the homeopathic remedies. The title of the press-release was impressive: ‘Columbia and Harvard Researchers Find Yoga and Controlled Breathing Reduce Depressive Symptoms’. It certainly awoke my interest and I looked up the original article. Sadly, it also awoke the interest of many journalists, and the study was reported widely – and, as we shall see, mostly wrongly. According to its authors, the aims of this study were “to assess the effects of an intervention of Iyengar yoga and coherent breathing at five breaths per minute on depressive symptoms and to determine optimal intervention yoga dosing for future studies in individuals with major depressive disorder (MDD)”. Thirty two subjects were randomized to either the high-dose group (HDG) or low-dose group (LDG) for a 12-week intervention of three or two intervention classes per week, respectively. Eligible subjects were 18–64 years old with MDD, had baseline Beck Depression Inventory-II (BDI-II) scores ≥14, and were either on no antidepressant medications or on a stable dose of antidepressants for ≥3 months. The intervention included 90-min classes plus homework. Outcome measures were BDI-II scores and intervention compliance. Fifteen HDG and 15 LDG subjects completed the intervention. BDI-II scores at screening and compliance did not differ between groups. BDI-II scores declined significantly from screening (24.6 ± 1.7) to week 12 (6.0 ± 3.8) for the HDG (–18.6 ± 6.6; p < 0.001), and from screening (27.7 ± 2.1) to week 12 (10.1 ± 7.9) in the LDG. There were no significant differences between groups, based on response (i.e., >50% decrease in BDI-II scores; p = 0.65) for the HDG (13/15 subjects) and LDG (11/15 subjects) or remission (i.e., number of subjects with BDI-II scores <14; p = 1.00) for the HDG (14/15 subjects) and LDG (13/15 subjects) after the 12-week intervention, although a greater number of subjects in the HDG had 12-week BDI-II scores ≤10 (p = 0.04). The authors concluded that this dosing study provides evidence that participation in an intervention composed of Iyengar yoga and coherent breathing is associated with a significant reduction in depressive symptoms for individuals with MDD, both on and off antidepressant medications. The HDG and LDG showed no significant differences in compliance or in rates of response or remission. Although the HDG had significantly more subjects with BDI-II scores ≤10 at week 12, twice weekly classes (plus home practice) may rates of response or remission. Although the HDG, thrice weekly classes (plus home practice) had significantly more subjects with BDI-II scores ≤10 at week 12, the LDG, twice weekly classes (plus home practice) may constitute a less burdensome but still effective way to gain the mood benefits from the intervention. This study supports the use of an Iyengar yoga and coherent breathing intervention as a treatment to alleviate depressive symptoms in MDD. the results cannot be generalized to MDD with more acute suicidality or more severe symptoms. At the end of the paper, we learn that the authors, Dr. Brown and Dr. Gerbarg, teach and have published Breath∼Body∼Mind©, a technique that uses coherent breathing. Dr. Streeter is certified to teach Breath∼Body∼Mind©. No competing financial interests exist for the remaining authors. The observed effects might have nothing at all to do with the specific intervention tested. The trial was poorly designed. The aims of the study are not within reach of its methodology. The trial lacked a proper control group. It was published in a journal that has no credibility. The limitations outlined by the authors are merely the tip of an entire iceberg of fatal flaws. The press-release is irresponsibly exaggerated. The authors have little incentive to truly test their therapy and seem to use research as a means of promoting their business. Aromatherapy for depression? Smells fishy, if you ask me! Aromatherapy is popular and pleasant – but does it have real health effects? The last time I tried to find an answer to this question was in 2012. At that time, our systematic review concluded that “the evidence is not sufficiently convincing that aromatherapy is an effective therapy for any condition.” But 5 years can be a long time in research, and more up-to-date information would perhaps be helpful. This systematic review of 2017 aimed to provide an analysis of the clinical evidence on the efficacy of aromatherapy specifically for depressive symptoms on any type of patients. The authors searched 5 databases for relevant studies Outcome measures included scales measuring depressive symptoms levels. Twelve randomized controlled trials (RCTs) were included. Aromatherapy was administered by inhalation (5 studies) or massage (7 studies). Seven RCTs showed improvement in depressive symptoms. The quality of half of the studies was low, and the administration protocols varied considerably among the studies. Different assessment tools were employed in the studies. In 6 of the RCTs, aromatherapy was compared to no intervention. Despite these caveats, the authors concluded that aromatherapy showed potential to be used as an effective therapeutic option for the relief of depressive symptoms in a wide variety of subjects. Particularly, aromatherapy massage showed to have more beneficial effects than inhalation aromatherapy. Apart from the poor English, this paper is irritating because of the almost total lack of critical input. Given that half of the trials were of poor quality (only one was given the full points on the quality scale) and many totally failed to control for placebo-effects, I think that calling aromatherapy an effective therapeutic option for the relief of depressive symptoms is simply not warranted. In fact, it is highly misleading and, given the fact that depression is a life-threatening condition, it seems unethical and dangerous.